One of mine and D’s Christmas traditions is a glass or two of Baileys on Christmas Eve and Bucks Fizz with breakfast on Christmas Day. Last year I was pregnant so I didn’t drink and this year I’m breastfeeding so will be having a dry Christmas again. 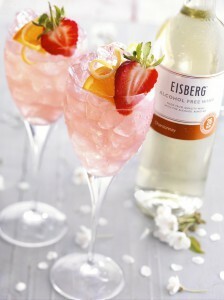 That doesn’t have to mean boring juices though, take a look at these mocktail recipes from Eisberg. Add a slice of pineapple, orange, lemon and lime to a mixing glass with 1 tsp of sugar and muddle with a rolling pin. Squeeze the juice of half a lemon and pour in with the fruit and sugar mixture and add crushed ice. 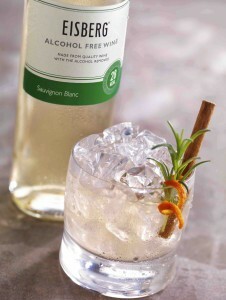 Pour 100ml alcohol-free Cabernet Sauvignon over the ice and stir. Strain the mixture into a wine glass and finish with crushed ice and lots of fresh fruit. 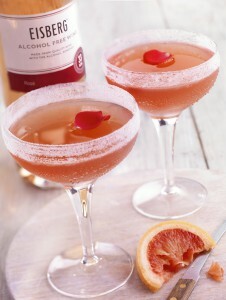 Add 100ml of alcohol-free Rosé to a mixing glass. 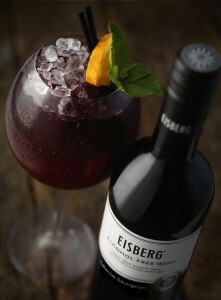 Eisberg alcohol free wines are perfect for designated drivers, health conscious or dieting men and women, those attempting Dry January, or those just wanting to cut back on their alcohol consumption. Made in the same way as regular wine, it is only after the wine is finished that the alcohol is removed, leaving no more than 0.05% left in it. The Eisberg grapes are selected for their ability to maintain the true taste of the grape variety after the alcohol has been removed. This is done using one of the world’s most advanced techniques to ensure that as much of the original character and flavours of the wine are kept intact. I love Eisberg, we usually have some at Christmas. I actually prefer this to wine with alcohol. It’s lovely. Brilliant giveaway – So nice to have a decent alternative! My partner, after realising he was starting to develop a problem, was brave enough to start attending AA meetings recently. I am so proud of his progress and these sound like a great way for him to still feel like he is part of the party without having to touch any alcohol! Thankyou for the chance! These look fantastic for the Christmas period! Brilliant product, wine and low in calories. I shouldn’t really drink alcohol because of the medication I take so this is a good idea, you can still feel like you’re joining in with everyone over Christmas without actually drinking alcohol. I recently was given a bottle of this and I must say I was very impressed, I will be buying more. great for us oldies who dont drink much. and for those driving who go to parties. In the last 12 months I have developed an intolerance to alcohol, this is just the ticket for allowing me to still feel a part of the celebrations at the Christmas table. Can’t drink atm so this would be lovely! The Summer Cobbler looks delicious. Would be interested in trying this particularly the Rose – thank you. My liver could do with a rest. I need this!! Great alternative for the driver! Always loved this… brings back memories of sunday lunch’s at grandmas! 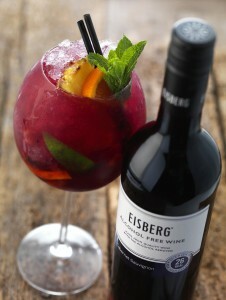 I love Eisberg wine, our favourite. As a teetotaller I would love to try this. Hooray! I am at a loss to know why alcohol free wine is not blogged about more often. There was just one bottle of Eisberg in my local supermarket before Christmas to serve my two guests on Christmas Day who were driving. Nothing else. And I had to find an assistant to point me to it. They both said it was very good indeed so I would be delighted to win. Wonderful giveaway – thank you. These recipes look delicious ! Fab prize – thank you!! Thanks for the giveaway, wine is my favourite tipple! I really liked Eisberg when I was pregnant. Thanks for the competition. I’ve not tasted this wine yet – would love to try it out! What great drinks you’ve put together here!!! Thanks for the opportunity and have a superb new year!